Bank Holiday Special: Review of "A Season in the Congo"
This is something different, but over the weekend, my mum, sister and I went to see the final day of A Season in the Congo by Aimé Césaire at the Young Vic. This was the first English production transformed for the stage by director Joe Wright (Anna Karenina, Atonement, Pride and Prejudice). I must preface this by saying I have not read the original play and while I know something about DRCongo, I would never claim to be an expert on the country. However, as someone extremely interested in the history and politics of African countries, it was great to get some understanding of the background to modern day DRC and a glimpse into the events leading up to Mobuto's rise to power. So what was it about? 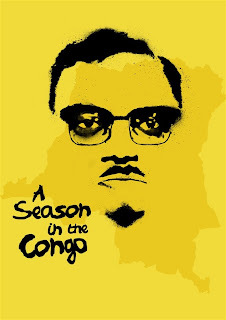 In a nutshell - the rise and fall (well, murder) of Patrice Lumumba - Congo's first democratically elected Prime Minister. We first meet Patrice in 1955 'Leopoldville'. He is a beer salesman. However, a few years later he is in prison for his political activism being brutally beaten by Belgian officials, reminding him of his place in life - as an African. Until he is released and allowed to attend a conference in Brussels. Lumumba eventually becomes Congo's first Prime Minister in June 1960 - a week before Congo gains Independence. What follows is the last seven months of Patrice Lumumba's life - because on January 17th 1961 he was executed by firing squad in the Independent State of Katanga. And a lot happened in the last seven months of Lumbaba's life - Africanisation of the Congolese Army with Joseph Mobutu being made a Colonel and Chief of Staff, Katanga seceding, the 'neutral' UN not helping out, Lumumba being deposed, a coup d'etat. And while the play had a lot to pack into a two and a half hour play, with a 15-person cast it worked. Chiwetel Ejiofor was amazing as Patrice Lumumba - I could sense the passion and love for his country Lumumba must have had. This was an honest man who wanted to unite his country, but might have been a bit too trusting, especially towards his close friend - Mobutu. And Joan Iyiola played his wife, Pauline, excellently. I could feel her pain as Lumumba constantly dismissed her visions or pleas for him to be careful. Her song 'Who's seen my husband?' is still stuck in my head. I have to say, the person that stole the show for me was Daniel Kaluuya who played Joseph Mobutu. The scene close to the end, when he takes off his Colonel's hat and puts Mobutu's famous leopard print hat for me was like - the transformation is complete. I found the transition from friend and confidante to this puppet, who you eventually know is going to become the stereotypical African dictator, that at one point I had to ask myself, 'When did that happen? And how did I not notice?' I also absolutely loved the portrayal of the UNs 'neutralness' in the entire case, as well as Lumbuba's passionate (unscheduled) Independece speech. The ambience of the Young Vic and the stage design which transformed you to 1950s/60s Congo was amazing. I felt like I was at a bar in 'Leopoldville', at Lumumba's home with his wife, Pauline and poolside in Katanga in the 1960s with Mobutu speaking to Tshombe. The choreograpy by Sidi Larbi Cherkaoui, coupled with the Congolese music, gave an even stronger sense of different situations portrayed in the play - the Congolese people welcoming the arrogant Belgian King on Independece Day, the battle scene and massacre in Katanga in which many were murdered. Also to differentiate between the black and white characters, prosthetic noses - and in the case of Hammarskjold, a blonde wig - were used. I enjoyed the way the roles the UN, USA, USSR and Belgium played in Lumumba's death were infused into the play - flags, puppets and voiceovers - and was also extremely happy it was not the 'generic' African accent used by the cast. At the end, when it was all done and the three of us left the Young Vic, we talked animatedly about what we experienced in the last 2 and a half hours and had more knowledge of the man Patrice Lumumba than we did before and took away with us a piece of Congo's history.